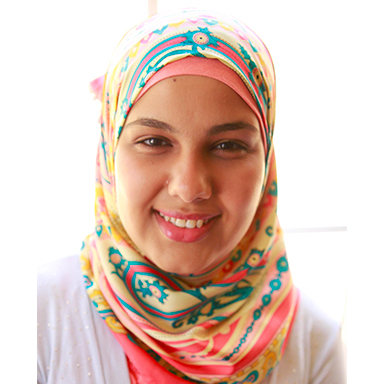 Duaa grew up in Dahshur, a village on the outskirts of Giza, Egypt. Inhabitants of this historical village live traditionally; they receive their religious teachings from local mosque sermons and clergy. Duaa joined the Azhari education system after the opening of the first school in Dahshur in 1999. Her father supported her joining the Azhari education system as he believed that Al-Azhar was an authentic moderate institution for Islamic studies. Al-Azhar has played a crucial role in civil society by evoking many questions related to women’s issues along with other questions pertinent to modern times. In September 2016, Duaa joined the Lazord Fellowship, through which she was placed at the Daal Center for Religious Research and Media, and worked with Believers without Borders. Her responsibilities included supervising religious affairs, managing seminars, compiling scientific research, and regularly publishing articles on Thewhat website. After reading al-Sakhawi’s book ad-Daw’ Allami”, Duaa felt the need to gain more legal knowledge, and got an internship at the Law and Society Research Unit at the American University in Cairo. This experience gave her great exposure to Islamic family law and its intersections with women’s issues. Constantly seeking new knowledge, she then wanted to understand more about how these issues are handled legally from the perspective of Islamic law (fatwa). Islamic jurisprudence is interpreted to achieve justice among the members of society, taking into account gender. She, thus, pursued postgraduate studies on the anthropology of the fatwa. She plans to continue her studies on the history of the development of fiqh and fatwa and how they deal with women’s issues in particular.